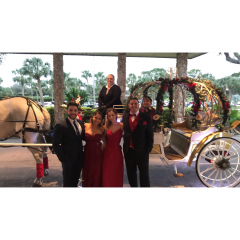 Personalized Horse & Carriage Services that will make your next event a memorable one! 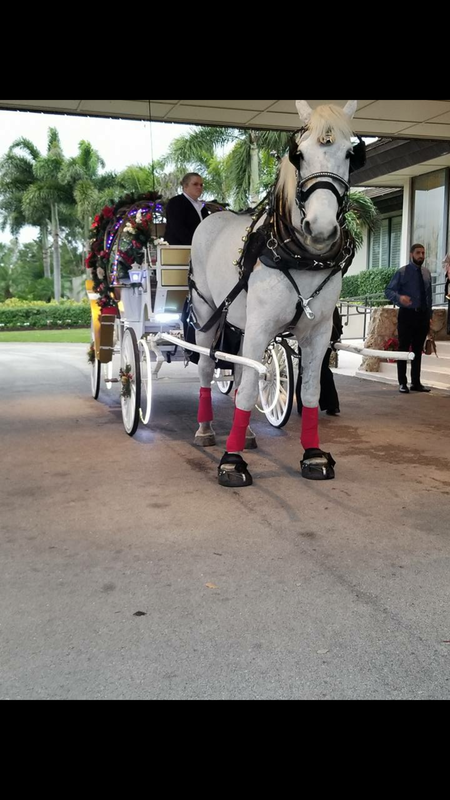 With our unique, custom carriages & wagons, your event is sure to be the talk of the town. We cater to weddings, barats, proms, homecomings, quinceaneras, bar/bat mitzvahs, sweet 16's, birthday parties, corporate events, funerals, and many, many more!! Even if you want to take your special someone for a private ride to "pop the question", we can customize our services to suit your needs. Have a group you want to take around town? We do that to! **** Please Note **** For the safety of our horses, carriages & clients, we cannot operate on roads over 35 MPH without proper security escorts. Lisa is a very sweet person that went beyond the call of duty to make sure that my wedding was beautiful. 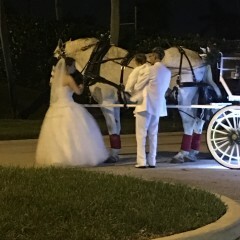 The way that she decorated the carriage exceeded my expectations. She was very flexible and understanding with me due to the limo company making me almost 2 hours late for my wedding. I received many compliments about her at the wedding and I will always keep in touch due to her genuine personality and professional business etiquette. I highly recommend her to add a spark to your big day!! I wish there was a better review than a 5 star. I would of gave you a million. 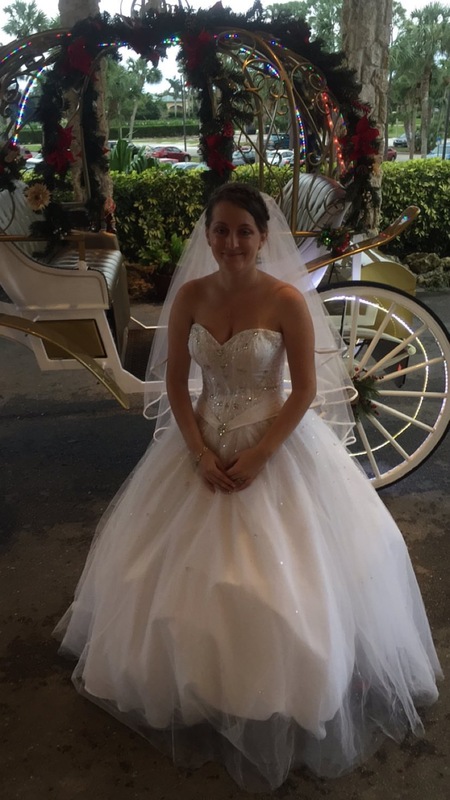 I can not thank you enough for everything you accomplished for my daughters wedding. You went above and beyond our expectations. I know the kids will remember this day for the rest of there lives and I am so happy you are part of our family now. It was our honor & pleasure!! 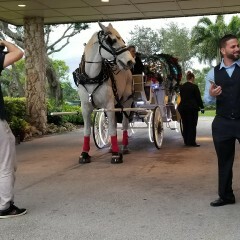 Thank you all SO very much for letting us be a part of not only their day, but the family!! Can't wait to see you all again!! 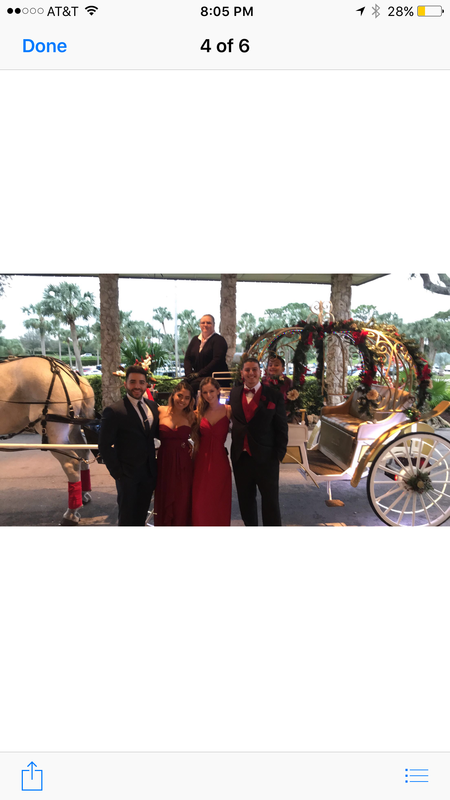 We strive to provide a fun, relaxing and memorable horse drawn carriage ride for each and every client, every time. The safety of our clients and team is our number one priority. Our team is trained in safe animal handling practices and always ensures that our horses are taken care of and treated in an ethical manner. 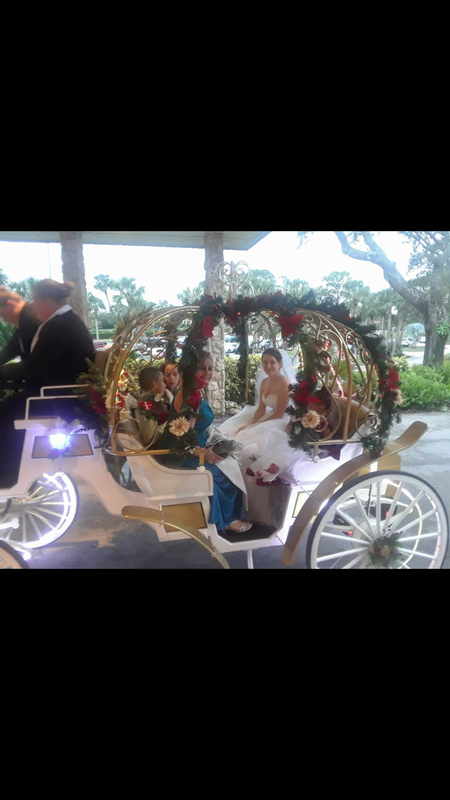 Our custom built Cinderella Carriage is white in color with gold leather seating, equipped with a stereo system for use with iPod, iPhones, etc. 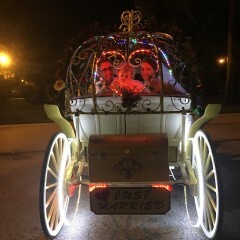 The LED lighting with multiple colors completes this beautiful and unique carriage. 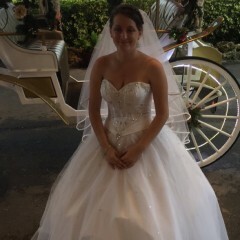 The Cinderella Carriage comfortably seats 4-6 adults. 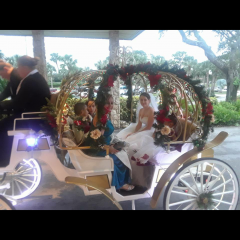 This carriage also has a canopy top for a traditional carriage look. Our custom built Paul Raber Carriage is wood with dark leather seats, comfortably seats 6-8 adults and is wheelchair accessible! The rear wall folds down, making a ramp for easy access for patrons with wheelchairs and has a Bluetooth system for your favorite music. 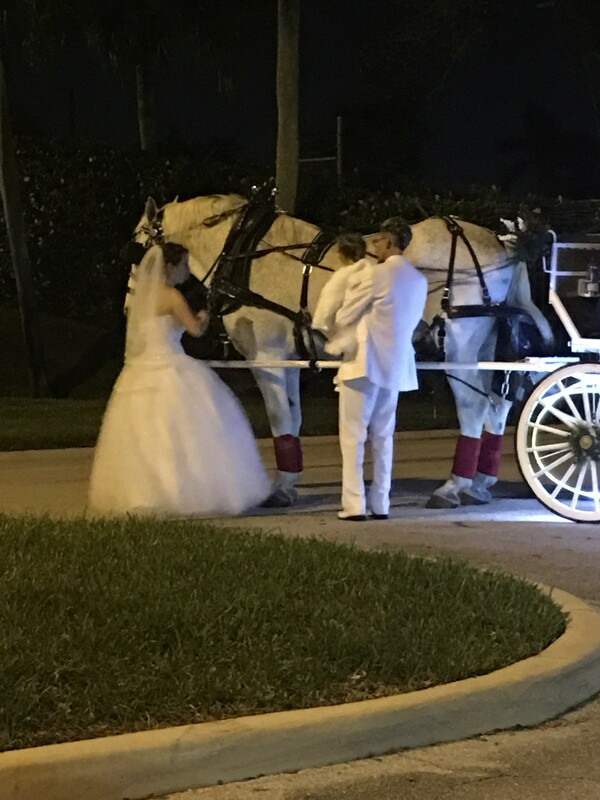 The soft white lighting completes this beautiful traditional carriage. Our antique buckboard wagon has been used for many decades by my great-uncle & has a wonderful family history behind it. If you choose this wagon, look for the horse shoe & ask us the story of Sweet Music. You will hear a true tale of family history that has come full circle. This wagon can be pulled by a single steed or a team of 2. Our antique doctors buggy has also been in the family for decades. This is an interesting carriage that will bring you back to the days of "Little House on the Prairie" era when Doc would come to visit. 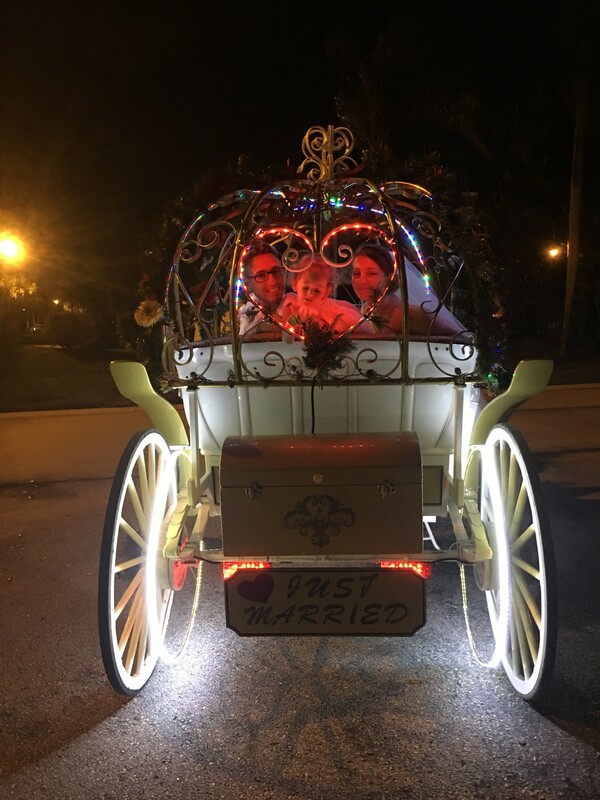 We can customize the decorations on our wagons, buggies and carriages the fit the theme of your event. Our 2 main horses are Frank & Buddy. They are both white Percheron geldings who were raised & trained in Virginia. Paired up as a team when they were young, Frank & Buddy competed & won several competitions, including The Classic. 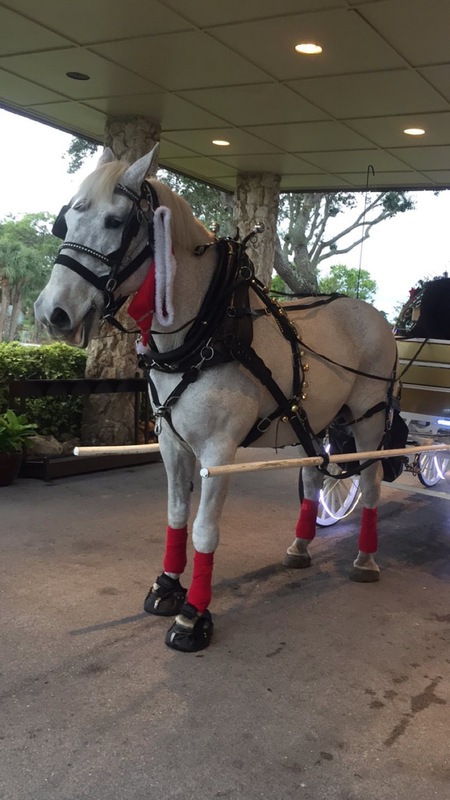 They went to a family who used them for their carriage company, and now they are residents of Florida. My great uncle has been very close friends of their first owner/trainer for over 3 decades. These boys are 2 of the best horses in the industry. Reliable, honest, trustworthy, stout & strong. They LOVE their jobs & look forward to working every time they see the harnesses come off the rack. Such gentle giants, they both stand at 17.3 hands & weigh 1800lbs each. Their collars fit comfortably around their necks, and their harnesses are custom fit to each horse. The carriages are checked & maintained daily for safety, security & comfort for all our patrons, our horses & our staff. Our staff consists of a team of family & friends who have a love of horses & truly enjoy what we do. 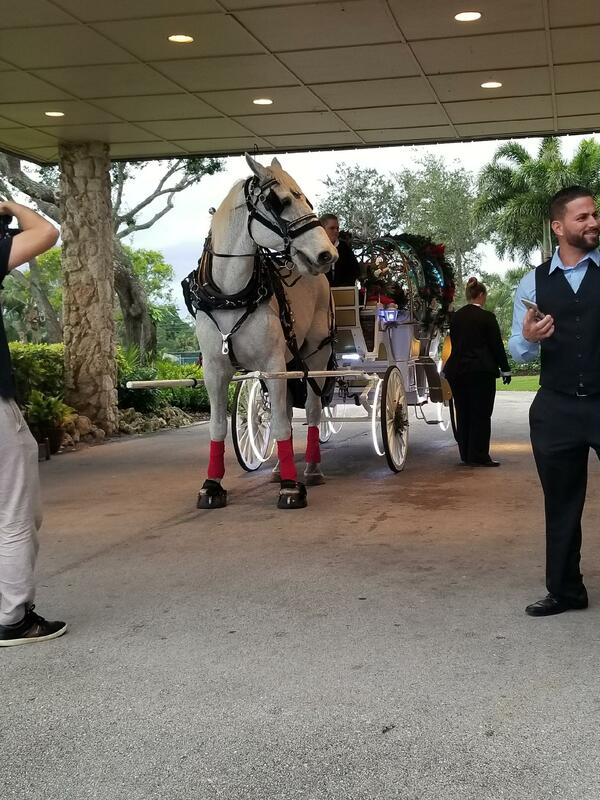 Preparing not only ourselves but our horses & carriages for your specific requests is long, hard & tedious work, but the smiles on the faces of our patrons makes it all worth it. We love what we do; it gives us great pleasure to serve our clients and our team maintains a serious work ethic continuously. We strive to serve you with the utmost respect, comfort, pride & professionalism & look forward to seeing how much our clients enjoy our services. Making memories of special times in your life is what its all about. We are a husband and wife team, along with our 11 year old daughter we own and operate a small family farm in Florida. With our own personal horses we actively compete in shows, trail ride, and continuously train other horses for carriage work. We work diligently with our beef and swine to facilitate our "Farm to Table" program, which we have had great success with over the years. Our daughter is an active member of 4H, she shows cattle, swine and horses at local fairs & horse shows. Her goals are to become a large & exotic animal veterinarian. Our goal is to help make that come true. Teaching her as much as we can & letting her assist in every aspect in the operation of the farm, she is sure to be a top class lass! From reaching in & pulling out baby show pigs, to raising & training her own colt, she is sure to continue the legacy of our family with livestock & horses. Due to live horses, we cannot provide services where loud dogs, fireworks, or explosives are used. 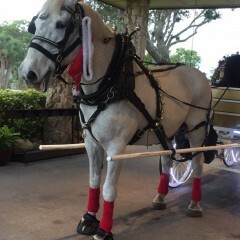 Our carriage horses will only pull at a walk or light trot. For our client & horses safety, we cannot travel at a faster pace. The safest routes on roadways should have a speed limit of no more than 35mph. Roadways with more than 35mph speed limits require security escorts provided & paid for at the clients sole expense. Some terrains such as sand, mud, soft grass & rocks may not be safe for the horses or carriages. Steps, curbs, steep or uneven terrain, and sharp turns could cause severe injury to our horses & damage to our carriages. Please take this into consideration before planning your route for your event. Photos, maps, and satellite images of the venue locations are very helpful in helping us make your event go smoothly & comfortably. We must have a proper location to park our rigs (trucks & trailers) away from heavy traffic areas in order to safely load, unload, and prepare our horses. Our stereo system is equipped to play your favorite music using iPod, iPad, iPhone or other devices that can be plugged into the deck. We are a Husband/Wife/Daughter team than decided to venture into making our dreams of horses go even further by purchasing a carriage company from a wonderful couple who have been great influences & have guided us to where we are now. A blossoming carriage company with repeat clients, a wonderful support system of family, friends & previous owners who fully believe in our dreams & goals to make others smile while still enjoying what we do. For years now, we have worked with children & adults in making their dreams come true learning to ride horses. It has always been a strong desire to see that huge smile on the face of a rider who has accomplished a goal. Working with some children with special needs has been an incredible experience. Putting that smile on the face of a rider & watching as they continue to grow & succeed has made it all worth it. And now, our goal is to put smiles on the faces of others & memories in their hearts that they will forever remember & talk about for years to come. You never know which client will have that same drive & desire as I did all those years ago. 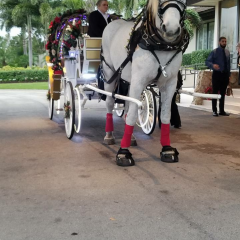 From our family to yours, we hope when you choose our company for your event that it will be as spectacular, unique & fulfilling as you can imagine!